One of the characteristic features of our modern economy is interdependence between firms (Lamy 2013). Firms purchase and sell goods simultaneously and these customer–supplier relationships generate a huge and complex network, through which individual shocks can propagate across the economy. For example, since transactions between firms are frequently performed on trade credit, the bankruptcy of a customer may worsen the financial conditions of its suppliers and in turn lead to another bankruptcy of its suppliers. In essence, the bankruptcy of a few firms may trigger a large-scale bankruptcy propagation involving many firms. If so, how large is bankruptcy propagation empirically observed in an economy? What is the risk of a large-scale bankruptcy propagation? In a recent paper, I analyse two datasets for Japanese firms (Arata 2018): one contains daily bankruptcy records from 1 April 2013 to 28 February 2017, and the other is a record of the customer–supplier relationships of approximately one million firms. Combining these two datasets enables me to examine the evolution of bankruptcy propagation on the customer-supplier network. An important feature of a customer–supplier network is its connectivity. I find that 79.7% of the firms analysed are directly or indirectly connected to each other through the customer–supplier relationships, constituting a huge connected component. 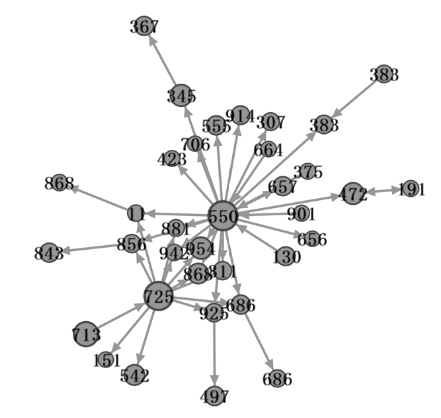 Furthermore, within this connected component, firms are connected by a short path, that is, the average shortest path length between the firms is 3.85 (measured as the number of customer-supplier relationships). This implies that there are paths through which bankruptcy shocks can potentially be transmitted and propagate widely in the economy. Next, I consider a subnetwork consisting of the bankrupt firms and network ties between them. If bankruptcy propagation frequently occurs, a bankrupt firm would have a network tie to another bankrupt firm, and therefore, this subnetwork would be well-connected. However, in sharp contrast to the underlying customer-supplier network, this subnetwork is disconnected. First, the vast majority (88.7%) of bankrupt firms are isolated, that is, they have no network ties to other bankrupt firms. By definition, the isolated bankruptcies did not trigger any bankruptcy propagation. Second, even when we focus on the remaining bankrupt firms (i.e. bankrupt firms with at least one network tie to another bankrupt firm), the size of each connected component is small (the sample average is 2.43) and is 2 for most of the cases – that is, the component consists of two bankrupt firms and a network tie between them. Even for the largest one, its size is 35 as shown in Figure 1. Therefore, while small-scale bankruptcy propagation is empirically observed, its reach is very limited. Notes: Each circle represents a bankrupt firm and the numbers represent working days since 1 April 2013. To quantify the effect of bankruptcy of transacted firms, I perform a survival analysis and estimate the increase of bankruptcy probability when a transacted firm faces bankruptcy. Our estimate shows that the increased probability of bankruptcy is statistically significant – according to our findings, if 50% of customers go bankrupt, the probability of bankruptcy for the supplier increases by a factor of 1.88. Therefore, the bankruptcy of transacted firms is an important factor and the negative shocks are transmitted through the customer-supplier network. However, this significant contagion effect at the firm level does not necessarily mean the occurrence of a large-scale bankruptcy propagation having a substantial impact at the macro level. In fact, by simulating our model based on the estimates, we find that no large-scale, and in fact only small-scale bankruptcy propagation occurs, consistent with the empirical observation mentioned above. Why does large-scale bankruptcy propagation not occur, even though there is a significant contagion effect at the firm level and many short linkages between the firms? The key is the network structure. In general, network connectivity has two competing effects on the likelihood of bankruptcy propagation: the transmission of bankruptcy shocks and a diversification effect (cf. Elliott et al. 2014). Consider an extreme case where there are no network ties and firms are completely independent of each other. In this case, bankruptcy shocks cannot propagate. As additional ties are added, the probability of bankruptcy propagation increases because paths through which shocks can propagate are newly generated. In other words, network connectivity contributes to bankruptcy propagation. The other extreme case is a complete network, that is, firms are connected to all other firms. In this case, network connectivity prevents bankruptcy propagation because any bankruptcy shock is dispersed between many other firms and immediately dies out. Our statistical results suggest that the diversification effect is dominant for the customer-supplier network. To confirm this point further, by using Leontief’s inverse matrix as in the usual input-output analysis, I examine the speed at which bankruptcy shocks fade in the network as the path length between firms becomes longer, that is, I calculate the impact of a customer’s bankruptcy on the nth indirect supplier (e.g. 2nd indirect suppliers mean the suppliers of suppliers of the bankrupt firm). 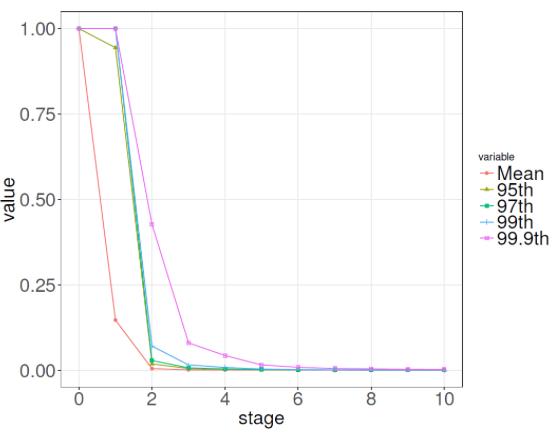 Figure 2 shows the results, suggesting that the impact rapidly decreases as n increases, and is close to zero when n is three. This property is closely related with the high connectivity of the network; many firms are connected with a short path and a supplier has many nth indirect customers even when n is small. Therefore, from the viewpoint of a supplier, bankruptcy of an indirect customer is just one of these many indirect customers. Similar to the case of the complete network, bankruptcy shocks immediately die out rather than propagate on the customer-supplier network. Therefore, the customer–supplier network plays a role in preventing, rather than contributing to, bankruptcy propagation. Notes: The horizontal axis represents n (i.e., the path length between a customer and an indirect supplier). With the increasing use of big data, the ease of in-depth examinations about macroeconomic phenomena based on micro level data is increasing. Indeed, by using firm level data, we can directly observe how bankruptcy propagates on the actual network over time. We find that the macroeconomic consequence (e.g. the scope of propagation) depends crucially on the details at the micro level (e.g., the network structure). More work remains to be done to understand the complex behaviour of economies by further exploiting big data at the micro level.